Prime minister was direct to the supreme law of India, head of government, head of state of the republic of India, all the members in the group which is under the prime minister. Prime minister has the authority to select a candidate or to dismiss from the other members of the cabinet and provide posts to members. If in case of death or resignation of prime minister then the cabinet will be dismiss. Prime Minister was governed by the president. Prime Minister can become the member of the parliament after or within the six months to the post of prime minister, if they are not the member. Power of the Prime Minister is that they guide the functioning and the authority of the government of the India. Prime Minister was summoned by the president of India in the parliament house. The prime Minister recommends the members of the council of minister to the president of India. Prime Minister also has the authority to encourage or give the suggestion to the president of India for giving the distribution of works to the different governments of ministers. Prime Minister has to plan and go to sessions of the houses of parliament. Prime minister has to response all the questions asked by the members of the parliament. Power of the Prime Minister is that they guide the functioning and the authority of the government of India. To encourage or give the suggestion to the president of India for giving the distribution of works to the different governments of ministers. Prime Minister is the leader of parliament, as he can take a part in debates in the house of which he or she is not the member. Prime minister has the authority to select a candidate or to dismiss other members of the cabinet and provide posts to members. If in case of death or resignation of prime minister then the cabinet will be dismissed. If any opinion arises between Prime Minister and any other minister then the opinion of prime minster will be taken. Prime Minister has the authority to recommend the president to announce the emergency war on ground or armed rebellion. Prime Minister has the power to terminate the Lok Sabha before expiry. Elected year -1947 to 1964. Political Party- Indian National Congress. Lal bahadur Shastri is the 2nd Prime Minister of India. He elected 1 time as a PM. Indira Gandhi the daughter of Pandit Jawaharlal Nehru was the 3rd and the only woman Prime Minister of Indian. She elected 3 time as a PM. Morarji Desai is the 4th Prime Minister Of India. Charan Singh is the 5th Prime Minister Of India. Rajiv Gandhi is the 6th Prime Minister Of India. Vishwanath Pratap Singh is the 7th Prime Minister Of India. Political Party - Janata Dal. 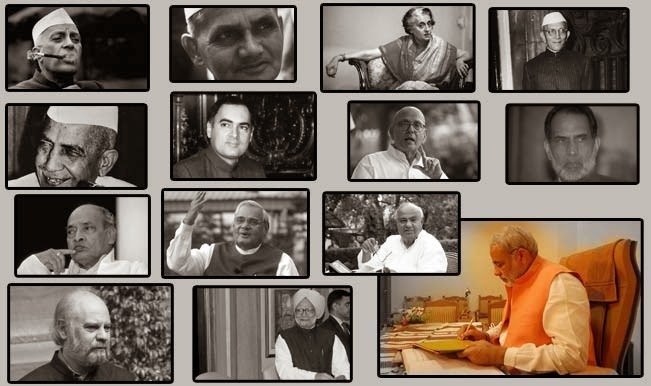 Chandra Shekhar is the 8th Prime Minister Of India. P. V. Narasimha Rao is the 9th Prime Minister Of India. Atal Bihari Vajpayee is the 10th Prime Minister Of India. He elected 3 time as a PM. H. D. Deve Gowda is the 11th Prime Minister Of India. Inder Kumar Gujral is the 12th Prime Minister Of India. Manmohan Singh is the 13th Prime Minister Of India.